You can view the scheduled and actual production (gross and net) for a given day or week. The amounts are available in numerical and graphical form. Gross production reflects the sum of expected incomes without any discounts or adjustments having been deducted. This could be used as an indicator of a provider's efficiency, especially for recare scheduling effectiveness. Net production reflects the cleared amount (take home pay) for an office (location). This could be used for predicting the real�incomes from computations based on planned work and could be used for salary calculations and determining an office's (location's) profitability. The production amounts are calculated based on each scheduled procedure having one of the following statuses: Planned, Completed, or Other. However, Planned procedures that are not scheduled are excluded from calculations. With the week view, you can view the production totals for each day of the week by clicking (or tapping) the corresponding View Gross and View Net links. 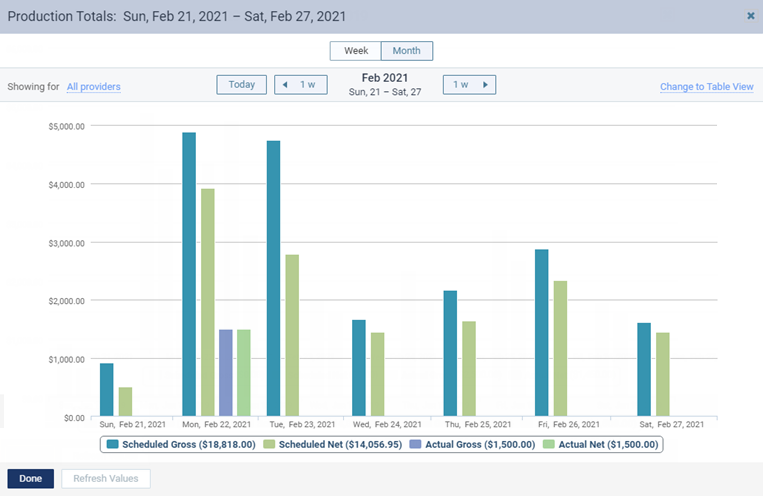 With the week view or the day view, you can view the production totals for each day of the week being displayed or for each day of the week of the day being displayed by clicking (or tapping) Production Totals in the upper-right corner. If you are viewing the Calendar page, click (or tap) the Renew links. If you are viewing the Location Production dialog box, click (or tap) Refresh Values. I can see these numbers for yesterday (Monday), but all future days show '0' for both numbers. Is there a setting that needs to be turned on? I cleared the cache, cookies and restarted Chrome. There isn't a setting. But the only thing I can think of to try is to verify that the applicable procedures in the provider's fee schedule are not $0; or if the provider doesn't have a fee schedule, verify that the fees for those procedures in the location's fee schedule are not $0; or if the location doesn't have a fee schedule, verify that location's default fees for the procedure codes are not $0. If all the fees are setup correctly, and this still doesn't resolve the issue, please contact the Support department. The scheduled and actual production numbers seem to be buggy. So far today we have produced zero and actual says $4700! We rolled a fix to our servers for this issue at 10pm on 3/19/2015. It is reporting the correcting information now. If the numbers are still off and you verified that there are procedures in the Progress notes or Treatment Planner, then please contact the Support Department. is there a way to view the scheduled amounts by column? it would be easier to see that way to track our hygienist's scheduled production separate from our dentist. Sorry, but I think your only option for that would be a custom report. There are a variety of filters and data sets that should give you a report to show scheduled production for hygienists and dentists separately. Using the "Analysis - Scheduled Production by Month" report, I was able to whip something up. You could do something similar and save it as a new report template for later use. Hope this helps.